The "Revolution of Dignity" started today, on the feast of St. Michael 21 November 2013. This year the country is still in conflict with some 10,000 dead since that day four years ago. However, if was certainly a historic turning point for the Ukraine and for the citizens of Ukraine and Ukrainians throughout the world. The world watched riveted to television and computer screens for weeks on end as they watched the surreal uprising. The "Maidàn" was a place - Kyiv's Independence Square - as well as a concept and a movement and a beacon of hope for all people's that have struggled to be free and independent and sovereign. Ukraine has struggled for centuries with greater and lesser success, but never achieving true democratic autonomy. They decided that winter that it was then or never. The Church was there with them. Not carrying arms, but leading them in prayer and seeing to their spiritual and pastoral needs at that time of trauma and tragedy and hope. There were chapels set up on the square. Religious services were held daily. Priests dared walk in no-man's-land carrying nothing but a cross, and icon and a prayerful plea for peace and integrity and mercy. Since the crisis on the Maidàn shifted to the occupation of Crimea and the ongoing war in the eastern provinces, the military chaplaincy has blossomed into a ministry that serves the soldiers, the families of the wounded and killed and a nation traumatized by events that were unthinkable four years ago. The people of Ukraine have enjoyed a very qualified success since then. Nearly two million refugees were forced to leave their ancestral homes. The latest count recognizes some 30,000 casualties… 10,000 of those fatalities. Countless families irreparably scarred. Many churches and religious communities in Ukraine and around the world are remembering this anniversary not only because of its great significance for Ukraine and for the human struggle everywhere, but because the people that were at the heart of the Revolution are very much in need of prayer. The city of Lviv held a massive ecumenical prayer rally in the heart of the city on the aptly named Freedom Boulevard. 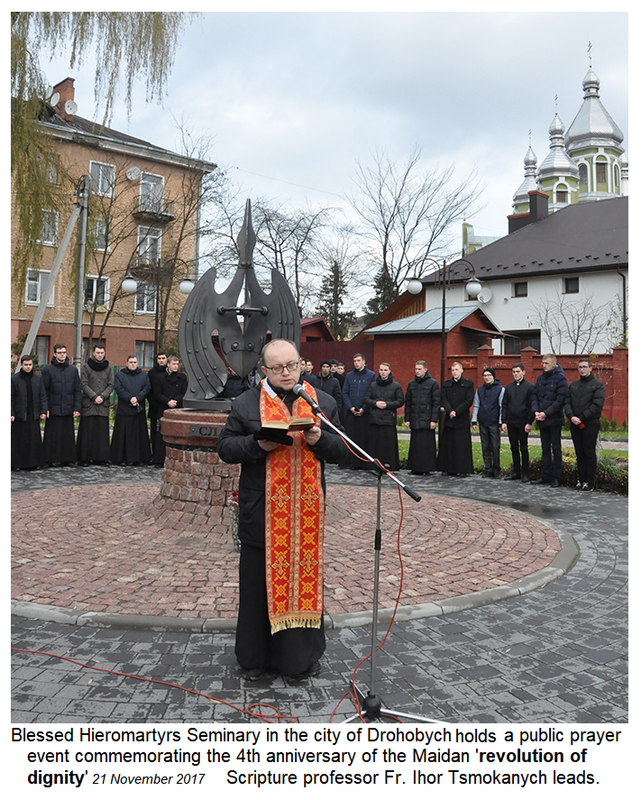 Many events took place around the country like the prayer service organized by the seminarians in Drohobych on the newly established ‘Heavenly Hundred Square' named after the 100+ people that were shot on the Maidàn in Kyiv. The events of four years ago were only a beginning. In fact, many dare say that much ground has been lost and that the ideals of those that came out into the squares of their towns and villages have been compromised. Surely there is still some hope and the struggle for true freedom according to the will of the Lord will go on. After all, the people of Ukraine rose up with the Peoples Movement "РУХ" movement in the early 1990s, there with greater strength in 2004. Finally, they rose up with fierce determination in 2013 and continue to resist foreign occupation. If need be, they will probably rise up again with a resolve that may surprise them as much as their would-be oppressors.